Biography & Genealogy: Washington Franklin Sydnor, Class of 1860. Genealogy: Born 29 July 1838, Dinwiddie County, Virginia. Father: Capt. 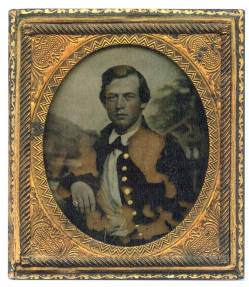 Joseph A. Sydnor (1814-1864); Mother: Mary Virginia Meredith (1821-1896); Paternal Grandfather: Capt. John Taylor Sydnor; Paternal Grandmother: Mary Thweatt; Maternal Grandfather: Lewis Meredith; and Maternal Grandmother: Mary Roper. Marriage: 6 June 1866 to Sarah Elizabeth Davidson. No children. VMI Record: Enrolled on 21 July 1855. He repeated his 4th Class (Freshman) year due to academic deficiencies. His 1st Class (Senior) year he participated with some other VMI cadets in providing a guard a the execution of John Brown in Charles Town, Virginia. He graduated 36th in his class on 4 July 1860. Military Record: Civil War - 1st Lieutenant, Company "C" , 41st Virginia Infantry Regiment -"McRae's Rifles;" entered service 9 May 1861 for one year; discharged in May 1862; re-enlisted and elected 1st Lieutenant in Company "G", 41st Virginia Infantry Regiment, on 4 April 1863; received a shell wound to the middle third of his left thigh during a skirmish east of Chancellorsville on 1 May 1863 and promoted to Captain; hospitalized in 1863 and 1864; listed on the roll for Graham's Horse Artillery as a Private during 1864 and/or 1865; retired to the Invalid Corps in 1865. Occupation: Civil Engineer before the Civil War; Chief of Police in Petersburg, Virginia in 1870 and 1871; Yardmaster for the Atlantic, Mississippi, and Ohio Railroad in Petersburg in the 1870s; 6th Assistant Superintendent and a guard at the Virginia State Penitentiary in Richmond in the early 1880s; and a Salesman for Baughman Brothers in Richmond up to his death. Death: 28 December 1887 in the family home at 11 Guarantee Street in Petersburg, Virginia. Burial: Blandford Cemetery in Petersburg, Virginia.